Howard Miller consistently designs the most dignified, classic furniture pieces for warm entertainment spaces. It’s difficult to find bar stools that match antiqued bars and bar height counters. Howard Miller takes the challenge, and excels with options. The Cheers Bar Stool is a classically shaped bar stool, featuring a footrest, four legs, a swivel seat, armrests and a tall backrest. Form may be important, but functionality is required when it comes to seating options. 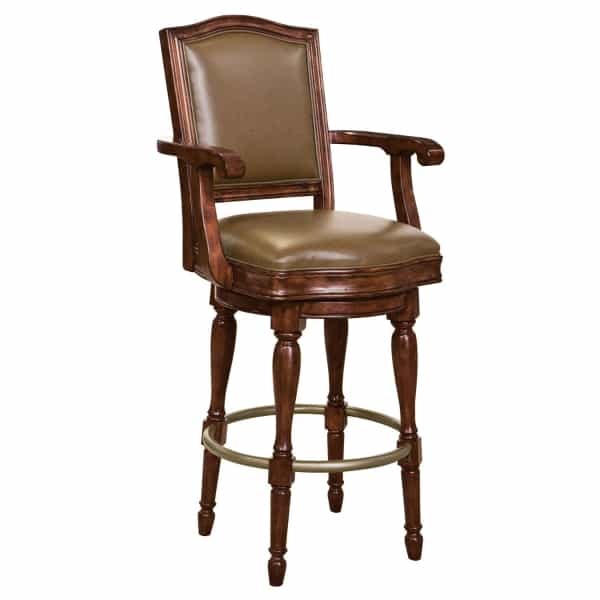 Comfort is the highest form of functionality for a bar height stool. This one has every feature necessary. Then, the form matches the superior performance with ornate detailing. The Hampton Cherry finish provides a lightly distressed, aged appearance. The brown faux leather cushion and backrest compliments the aged look with beauty, and the footrest is made of antique brass toned metal. With the Cheers Bar Stool, you’ll find ornate detailing from top to bottom, and you will enjoy superior comfort features.